A business is worth, roughly, the present value of its future earnings plus the present value of its assets. Since business valuation is never a science, the approximation is just that – an approximation. The value of an individual share equates to the approximated business value divided by the number of shares outstanding. Notice: Share price does not necessarily equate with share value. Perhaps profound when initially uttered by John Burr Williams, the aforementioned verbiage is almost certainly now cliché. Nonetheless, it forms the bedrock for security analysis and is the basis for the following thesis. RightNow Technologies provides RightNow CX, an on demand (“cloud-based”) suite of customer experience software and services designed to help consumer-centric organizations improve customer experiences, reduce costs and increase revenue. In a nutshell, RightNow Technologies is a software company focused on Customer Relationship Management (CRM) software. They are based in Montana, but have roughly 1,900 clients in various industries across the globe. The following figure illustrates their sales according to industry. As illustrated in the figure above, 2010 has been the best year so far in terms of both sales and earnings. $185.5M in sales and pre-tax earnings of $12.55M is a respectable performance. If 2010 pre-tax earnings represent the earning power of the business, then applying a 35% statutory tax rate should approximate the after-tax earning power. Under these assumptions, the normalized after-tax 2010 earnings would be roughly $8.16M. The $15.84M in the Provision for Income Tax line is the result of a deferred tax asset valuation allowance and is not part of normal business operations. Simply, the company is highly leveraged but liquid. 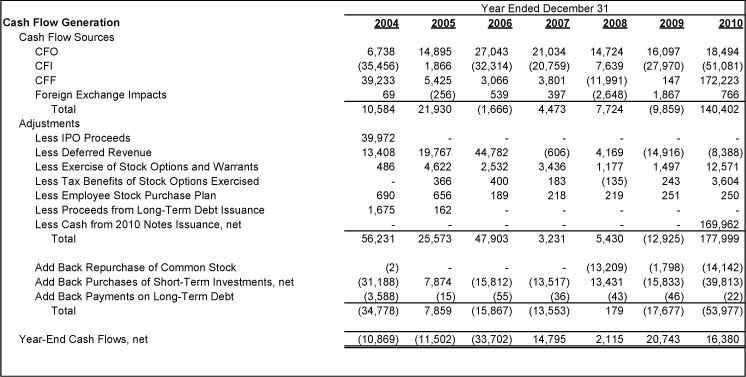 At year-end 2010, the company had $379M in total assets and $80M in equity. 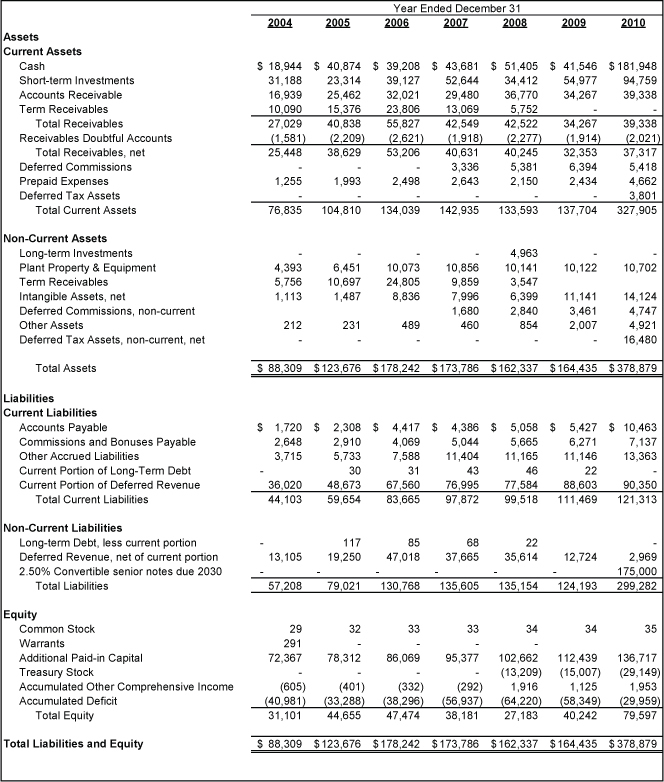 Operating cash flows at RightNow are anemic. From either the perspective of market valuation ($1.09B) or in comparison to the comparably sized 2010 peer companies listed in the 2011 Proxy Statement, operating cash flows have been lackluster. Further inspection reveals that the economics of the business is even less favorable than what appears after a cursory scan of the cash flow statement. Cash flows from deferred revenue, stock options (and the associated tax benefits), and the employee stock purchase plan have helped to mask the true business fundamentals. The figure below attempts to illustrate the true cash generating ability of the business by shifting cash flows to the periods where they are earned and by removing the effects from share purchases, stock options, etc. As illustrated above, the cash generating ability of the business appears limited. However, the company has had considerable success selling stock to option holders. Since its $40M 2004 IPO, it has collected roughly $31M from selling stock to option holders and collecting the associated tax benefits. Another important cash flow source has been deferred revenue. Basically, deferred revenue is cash collected today for goods/services promised later (think of a 12-month magazine subscription paid-in-full in January). Deferred revenue can be a wonderful source of supplemental business financing. However, a mediocre business is still a mediocre business even if it is financed wisely. 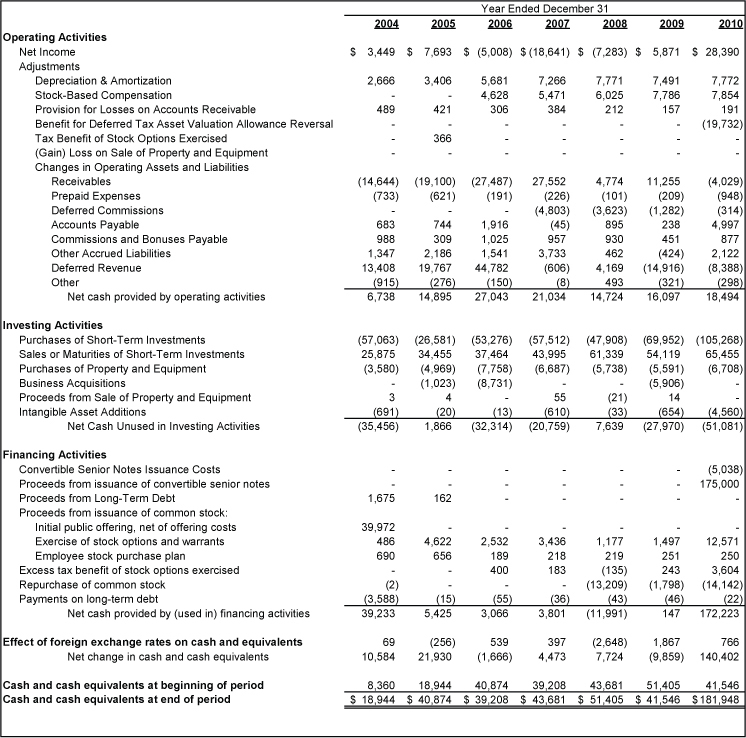 In the case of RightNow, large deferred revenue cash flows in 2004 through 2006 boosted CFO. Removing that effect until it is earned, as illustrated above, shows that the business was actually burning cash and not generating it. The darker side of deferred revenue intertwines with Revenue Recognition and Executive Compensation. Because the difference between “deferred” revenue and “earned” revenue requires judgment, conflicts of interest can arise if the situation is not appropriately managed. The company is aware of the judgment inherent in determining earned revenue and highlights it in the 2010 Annual Report (p. 35). The application of these rules requires judgment, including the identification of individual elements in multiple element arrangements, whether there is objective and reliable evidence of fair value, including, but not limited to, vendor specific objective evidence (“VSOE”) of fair value, for some or all elements. Changes to the elements in our sales arrangements, or our ability to establish VSOE or fair value for those elements, may result in a material change to the amount of revenue recorded in a given period. If deferred revenue and executive compensation are not properly aligned, then investors bear the risk of deferred revenue turning into a “cookie jar” that could be used to meet financial targets that trigger additional executive compensation (bonuses, pay raises, etc). The company currently leases its corporate headquarters, research and development facilities, technical support facilities, and principal administrative and marketing facilities from Genesis Partners, LLC. Greg Gianforte, our Chairman and Chief Executive Officer, and Steve Daines, our Vice President Asia Pacific, beneficially own, directly or indirectly, 50% and 25% membership interests in Genesis Partners, respectively. The remaining 25% of Genesis Partners is beneficially owned by Mr. Daines’ father, Clair Daines, who is a commercial real estate developer and builder. Just because the CEO and a Vice President own facilities critical to the business does not imply impropriety. In fact, a case could even be made that it benefits the business. However, it does have the potential to create a conflict of interest between RightNow and its current leadership. The owners of Genesis Partners currently collect roughly $1.3M annually from their ownership of the company’s facilities. If any event occurs where the company and its shareholders could be better suited under different leasing terms, then the CEO could potentially have to choose between his company and his external personal investment(s). A few examples can illustrate this possibility: 1) rapid business growth necessitating larger/different facilities 2) business contraction requiring fewer facilities 3) buyout/merger offer. On July 28, 2010 RightNow announced its intent to repurchase up to $10M of its common stock over the following two years. Since that date, the allotted amount has been increased three times and now totals $55M ($10M + $15M + $15M + $15M). Shareholders should be cheering, right? Perhaps. But, perhaps not. Later in this report the intrinsic value of RightNow Technologies will be discussed and compared against its stock price. For now, let us inspect the indicators that describe how the company feels about its share price. The ESPP allows employees to purchase shares at a discount to the market price. The size of the discount is determined by the Board of Directors and has been 5% since 2007. However, in 2011, the board increased the discount to 15%. If the stock was perceived to be cheap already, then why increase the ESPP discount? If the stock is not cheap according to conventional valuation metrics (Price to Earnings, Price to Sales, etc) and the presumed opinion of the Board of Directors (the increased discount granted to the ESPP), then what other reason could justify an ongoing stock repurchase plan? The reason must be compelling considering the repurchase program has increased by a factor of 5x over roughly the past year ($10M to $55M). The following figure puts the facts on a timeline. The Stock Repurchase Program was announced on July 28, 2010 and became effective on August 2, 2010. Throughout the remainder of 2010, the company bought back $14.1M of stock. Interestingly, insiders sold $10.3M during that same period. The single largest sale was $9.1M and it came from a trust where the CEO and his spouse are co-trustees, the Gianforte Family Charitable Trust. Between January 1, 2011 and June 30, 2011, the company had not repurchased any stock, but it has raised the amount allotted to the Stock Repurchase Program twice in 2011. Despite the increases in the Stock Repurchase Program, insider selling activity has increased relative to the past few years. Increased insider selling and increased funding to the Stock Repurchase Program without any additional stock repurchases seem to signal that management agrees with the presumed opinion of the the Board of Directors regarding the current stock price relative to its intrinsic value. 2010 executive base salaries ranged between $235K and $350K (one executive earned less, but he did not work a full year). Total compensation was considerably higher and ranged from $852K to $2M. Because incentives matter, understanding executive compensation at RightNow is important. 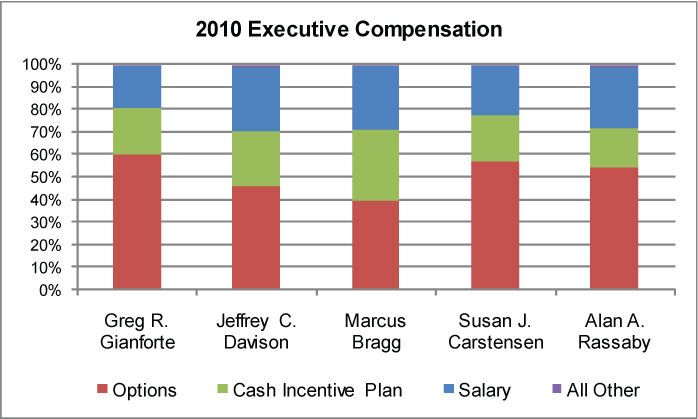 The following figure (derived from the 2011 Proxy Statement) illustrates 2010 executive compensation. As illustrated, base salary composed only about 30% of total compensation. However, stock options contributed 40% to 60% and the “Cash Incentive Plan” contributed 17% to 31%. Accordingly, it is critical to understand that the stock price (determines the value of the options) and the Cash Incentive Plan determine the bulk of executive compensation. Operating earnings, which is a measure of our profitability that we believe directly drives stockholder value through its impact on earnings per share. For our cash incentive plan, operating earnings is comprised of revenue less the cost of revenue less operating expenses. We use operating earnings before stock-based compensation expense because we believe the amount of stock-based compensation expense varies from period-to-period based on factors that are not, in management’s view, indicative of our underlying operating performance, and because stock based compensation is a non-cash expense. We believe this measure is important because the actions of management can have a significant impact upon operating earnings. These two metrics tilt the table in favor of management and could work against the shareholder. As mentioned earlier, “Sales” can be subjective and this much is acknowledged by the management. Businesses where revenue is often prepaid (RightNow’s business) must setup an account for revenue received but not yet earned. This dynamic creates a “cookie jar” of revenues that may tempt management when a difference between a reward and no-reward exists. It is important to note that the difference may not even be illegal – the determination rests with management. Can you really trust a potential fox to guard the hen house? The “Operating Earnings” metric could be equally detrimental to the shareholder. First off, in this context, “expense” to the company equates with “income” to the executive. 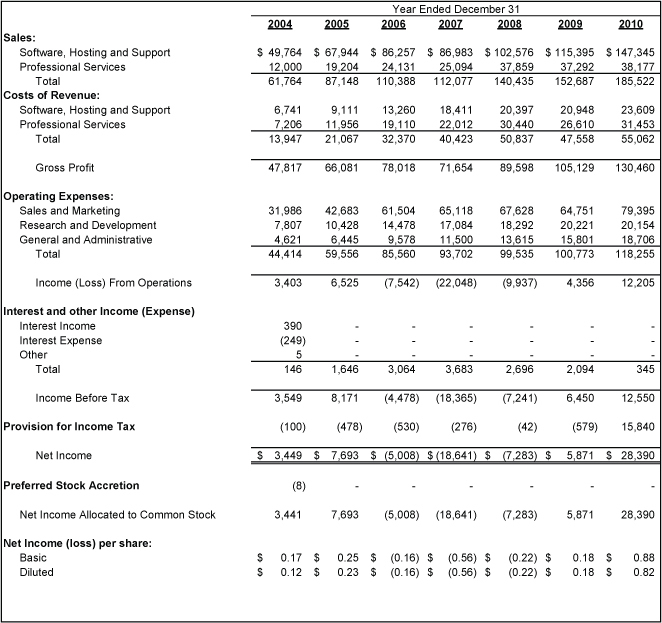 So let us examine how Operating Earnings reads from the perspective of an executive potentially receiving the benefit. We use operating earnings before your stock-based compensation expense because we believe the amount of your stock-based compensation expense varies from period-to-period based on factors that are not, in management’s view, indicative of your our underlying operating performance, and because stock based compensation is a non-cash expense. Removing stock-based compensation from “Operating Earnings” is ludicrous. If it is not an expense, then why not pay every employee entirely with “free” stock-based compensation? Additionally, if the resulting payout from stock-based compensation does not stem from the underlying operating performance, then why reward executives for what must then be luck? Insider ownership is comforting because it means that the insiders are investing their money alongside the money belonging to their shareholders. A cursory glance at the 2011 Proxy Statement is a bit misleading. Aside from the CEO (plus family and Trusts) who owns a solid 20+% stake in the company, the other directors and executive officers primarily own stock options and not common stock. Additionally, at least the bulk of these options were granted as compensation as opposed to willful cash investments. The figure below outlines insider ownership before and after accounting for stock options. Many of the options below did become common stock since the 2011 Proxy was released. The point, however, is to illustrate that the insiders have only modest exposure to RightNow stock aside from the options granted to them as compensation. 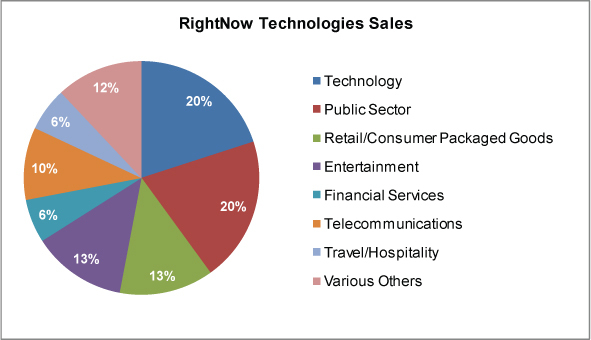 As of September 1, 2011 RightNow has a market capitalization of $1.09B. During 2010 the company generated $185.5M in sales and earned a pre-tax profit of $12.55M. Operationally, 2010 was by far the best year in history for RightNow. If 2010 is taken as the base case, then after-tax earnings might approximate something around $8M assuming a 35% statutory tax rate. Using no growth assumptions and assuming that 2011 will look similar to 2010, a $1.09B market cap means that we are paying 136x earnings and almost 6x sales. On a cash flow basis, the valuation is not much better. Using the cash flow estimates provided in the cash flow statement analysis above, we would be paying 52x peak operating cash flows. It is hard to imagine a growth scenario that would justify any further analysis. If cash earnings (revenue growth without earnings growth is meaningless) growth is modest to impressive and remains stable, then an earnings multiple between 12x and 25x values the business between $100M and $200M. On a per share basis, this equates to $3 to $6 per share assuming 33M shares outstanding. Under some circumstances it is worth sniffing around a little more and hopefully uncovering hidden assets or recognizing other opportunities for the company. Unfortunately in this case the valuation seems excessively wide of the mark. Succinctly, the company owns cash, valuable intellectual property, and a recognizable brand. Nothing in this story justifies a $1.09B valuation. RightNow investors are currently betting on major future growth. It is certainly possible. However, the current valuation already accounts for tremendous growth and anything less will disappoint. One potential positive opportunity for investors today would be a buyout offer. But, the leasing arrangements, debt covenants (specifically the convertible senior notes), and a lackluster history of profitability dim that prospect. RightNow’s crown jewel, its intellectual property, is unlikely to warrant the headache required to divorce it from everything else. Mix a mediocre business, a fancy price, and management incentives rife with conflicts of interest and the result may be an interesting short investment. The perverse incentive schemes, ill-timed share repurchases, and a management team without much “skin in the game” means that investors should bet with the management team and sell. Management was compensated nearly $32M in stock options over the past five years while investors, the folks bearing all the risk, earned a paltry $3.2M. Instead of holding their stock, investors should have been selling it alongside the insiders who did so after exercising their bonanza of stock options. As always, investors should do their own due diligence before making any investments.